It’s only been a few weeks since Starbucks announced they would be tantalizing the taste buds of Japanese customers with gingerbread and Christmas cake drinks for the holiday season. Now the popular coffeehouse chain has unveiled their second installment in this year’s lineup of exclusive holiday beverages, with the upcoming hot and cold White Chocolate Snow. Designed to conjure up images of a sparkling snowscape on Christmas Day, both drinks come with a topping that features layers of white, in the form of whipped cream, marshmallow, and white chocolate sauce. Silver chocolate pearls are then sprinkled on top, to resemble the glistening sparkles seen on freshly fallen snow. ▼ According to the company, the new beverages let you “view a Christmas world inside a cup”. 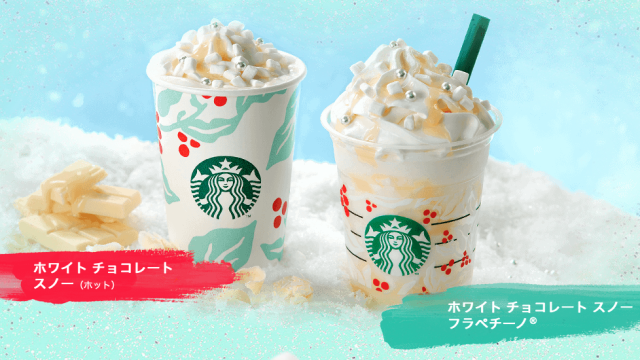 The White Chocolate Snow (left) is available in Short through to Venti sizes for 440-560 yen, while the White Chocolate Snow Frappuccino is available in a tall size for 580 yen. For those wanting a special keepsake, Starbucks have revealed their second range of limited-edition holiday drinkware. These items range in price from 950 yen for the Mini Cup Gift (pictured second from left in the middle row of the image below), up to 4,000 yen for the Pale Blue Slim Handy Stainless Steel Bottle (pictured on the left of the second row from the top). 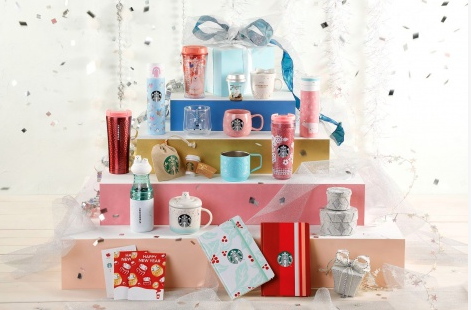 The limited-edition drinkware range and White Chocolate Snow beverages will go on sale at Starbucks stores around the country from Nov 22 until Dec 25. And how many teaspoons of sugar do this concoctions contain? This is going to be a hit. Gotta love the silver chocolate pearls. "And how many teaspoons of sugar do this concoctions contain?"